White men first noted the Yellowstone River in 1743 when an explorer named La Verendrye reached the area of the South Dakota's Mandan Villages. Later David Thompson of Canada's Northwest Company is credited with the first writing of the name in English, in 1798. 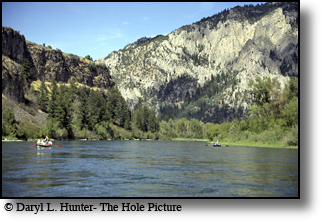 But David Thompson did not explore beyond the Yellowstone River's mouth on the Missouri. Indians before La Verendrye named the Yellowstone River and David Thompson came into the area. It was on the Yellowstone around Billings in 1806 when Lewis and Clark ran into Manual Lisa who was setting up a trading post when Manual Lisa recruited Lewis and Clark expedition member John Colter to go scout out the snake river and Yellowstone country for possible Indian traders for Lisa's trading post. 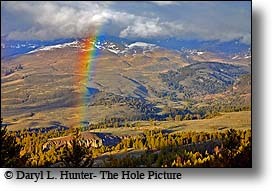 The Yellowstone River drainage hosts exceptional scenery and some of the most diverse wildlife on earth. You can see elk, bison, grizzlies, moose, majestic mountains, canyons and waterfalls. 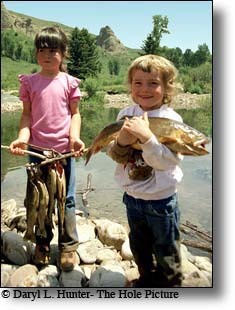 And is a world-renowned trout-fishing destination. 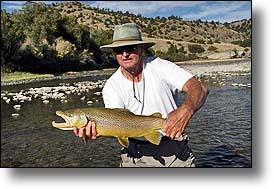 The upper Yellowstone is pretty much as it always has been, and is being managed by Yellowstone Park and Montana Game and Fish for the welfare of the fish and wildlife that live around it. This has preserved one of the best trout rivers, outside of Alaska or Canada. Winding through Yellowstone Park and into Montana to the town of Big Timber, the famous trout water of the Yellowstone flows for nearly 250 miles. This is the topic of this of this page. 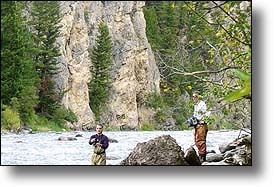 The river upstream from Yellowstone Lake presents a true wilderness fishing opportunity. This stretch of the Yellowstone runs through perhaps the most isolated area in the lower 48 states and can only be reached by hiking, horseback or crossing Yellowstone Lake. 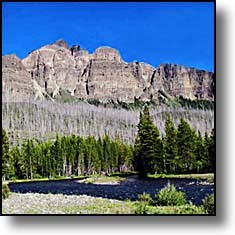 This is the Thorofare region and is the Yellowstone's 30 miles of headwater; The Yellowstone here is a meandering, braided stream with a clean gravel or sand-silt bottom. It is in a broad mountain valley, one to three miles across, which is often marshy or boggy. 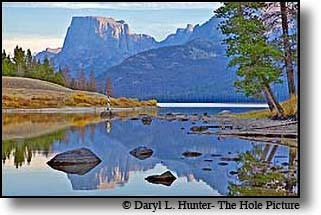 Where the headwaters enter the Yellowstone Lake is known as the Yellowstone Delta. Early July hatches include golden stones, little yellow sallies and caddis. From mid-July through August you'll find green drakes and pale morning duns. When the weather cools in September the blue-wing olive hatches keep you going till the fall snows chase you out of the mountains. 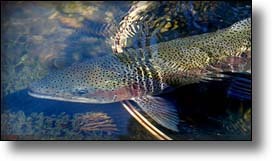 Trout spawn in this section from June till the end of July so some egg patterns may be a good choice also. Fishing Bridge Grand Canyon of the Yellowstone. The Upper Yellowstone from Yellowstone Lake to Gardner Montana stretches115 miles, carving it's way through two beautiful canyons, The Grand Canyon of the Yellowstone and Black Canyon, These canyons reach as high as 1,200 feet above the river. From Yellowstone Lake at Fishing Bridge the river emerges as one of the largest trout streams in the nation, Just below the lake outlet, the river is very wide at 300 to 400 feet across. This water is mostly broad and flat and broken by riffles, braids and pools. The first mile below the outlet is closed to fishing. From the end of this closed area to the start of the next closed area at Sulfur Caldron, is a stretch about six miles long that is so prolific that hundreds of anglers may be found fishing it's waters and it still remains a legendary fishery. 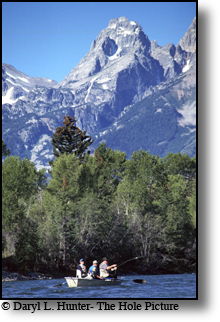 The fishing here is catch-and-release fishing only and is restricted to flies and single-hook lures. Only a small portion of the water can be covered by wading and flotation devices of any kind are not allowed. The most popular water is the nine miles below Fishing Bridge, including Buffalo Ford. Due to the sheer power of the river, crossing the river by wading is dangerous if not impossible in all but a few spots, such as Buffalo Ford, which can only be traversed during low water. 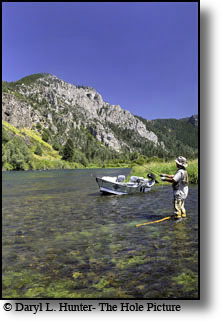 A couple of miles below the outlet the road winds along close to this awesome stretch of fishing providing good access. The river here is a large, deep, and smooth looking river but this is deceiving, this is a very powerful river so use all due caution. At Le Hardy Rapids the character of the river changes to a fast-water stretch about halfway between the lake outlet and Sulfur Caldron. At times, for study and management purposes, this area is closed to fishing. Buffalo Ford is the well-known spot where anglers compete for water by the tens of dozens. On some days, as many as 150 fishermen will visit this quarter-mile-long stretch and, incredibly, all will catch a few trout from two to three pounds. The river below Sulfur Caldron down to Alum Creek is closed to fishing and is a nature study area that is loaded with wildlife. 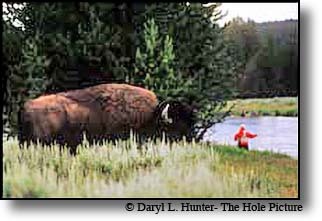 This is a great place to visit even if you can't fish it because the wildlife you may see here including bison, moose, mule deer, antelope, coyotes, muskrat, marmots, wolves, and grizzly bear. From Alum Creek to Chittenden Bridge the river bottom is a featureless affair of various silts, muds and clays over lava bedrock. The current is swift and becomes too deep to wade. 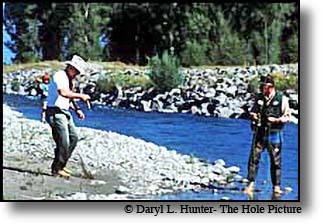 Due to the character of the river bottom and the lack of gravel, hatches are poor here; fish are fewer, however it does hold a few surprises. 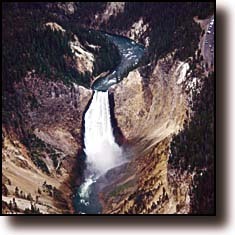 Lower Yellowstone Falls and the Grand Canyon of the Yellowstone River from the air. The Grand Canyon of the Yellowstone is jaw dropping beautiful. 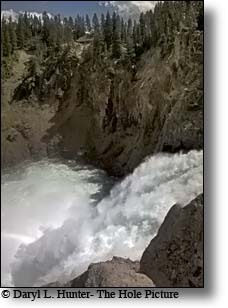 This canyon contains two magnificent waterfalls, the Upper Yellowstone Falls which is 110 foot tall and Lower Yellowstone Falls which is a drop of 310 feet to where the river courses below the 1200 foot yellow cliffs of the Grand Canyon of the Yellowstone. There are several safe locations from which the falls and canyon may be viewed. Some are a long walk down stairways and they provide many photogenic vantage points if you are up for a hike. There are trout in this stretch, but they are neither larger nor more plentiful than elsewhere although is seems like there should be. The Grand Canyon can only be reached by a steep 1,500-foot vertical climb into and out of the canyon. The river in the canyons is deep, turbulent, and runs over boulders that create powerful eddies and lots of pocket water. 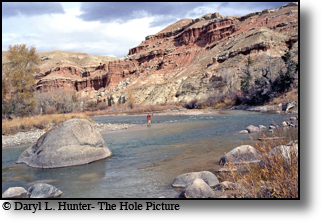 Wade fishing in the canyons is extremely dangerous, so you are better off fishing from bank. The river comes out of the Grand Canyon close to Tower Falls. 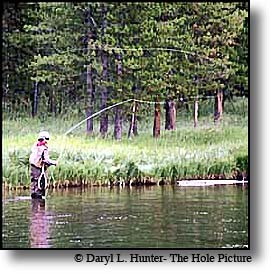 There is a mile or two of good, fast, pocket water above and below the Cooke City Road Bridge that is great to fish. Just down river from the Cooke City Road Bridge is the start of Black Canyon which stretches for about twenty miles to Gardiner Montana. From the head of the canyon to Gardiner, the river can't be seen from the road, and is a one to four miles hike from the Mammoth-Tower Junction Road depending on where you hike in from. Black Canyon provides fast water, runs, rapids and cascades. There are some very large pools, but they are pools with a powerful current. The pool bottoms are smooth bedrock and the rest of the river bottom is large freestone. Waders cannot generally be used, so wear your hiking boots to ease your hike. 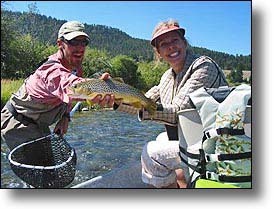 The Upper Yellowstone opens for fishing on Memorial Day weekend on Grand Canyon and Black Canyon, but not until July 15 at Yellowstone Delta (just above the lake) and from Fishing Bridge to the Grand Canyon. All areas close on the first Sunday of November. The canyons typically do not provide much action until early July, with the Delta picking up shortly thereafter. The window of opportunity is brief, as trout begin returning to Yellowstone Lake in August. Stoneflies, yellow stoneflies, green drakes, caddis, blue-winged olives and pale morning duns, and Caddis often produce blanket hatches during the summer. 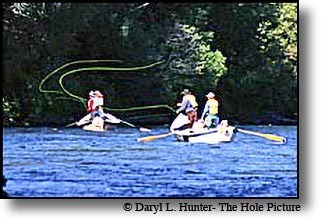 While some of the hatches carry over into September and into October, fishing in fall is much slower, because most of the trout above the falls return to the lake after the spawn. 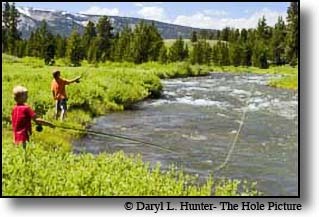 In the canyons, the optimal time to fly fish is late June through early July. There are several caddis species that generally are found along the current edges and in the quieter waters.